A plume of water vapor, sulfur dioxide, and other volcanic gases continues to escape from Kilauea’s Halema‘uma‘u Crater. Gas emissions from the Halema‘uma‘u Overlook vent began on March 12, 2007. By September of 2007, a lava pond was visible within the vent, and emissions of volcanic gases were almost continuous. Measurements on July 16, 2010, showed the vent emitting 700 tonnes (1,500,000 pounds) of sulfur dioxide per day—compared to an average of 140 tonnes (310,000 pounds) per day from 2003–2007. NASA’s Advanced Land Imager (ALI) aboard the Earth Observing-1 (EO-1) satellite acquired this natural-color image on July 15, 2010. The gray-blue plume rises from the vent, situated on the floor of Halema‘uma‘u Crater. 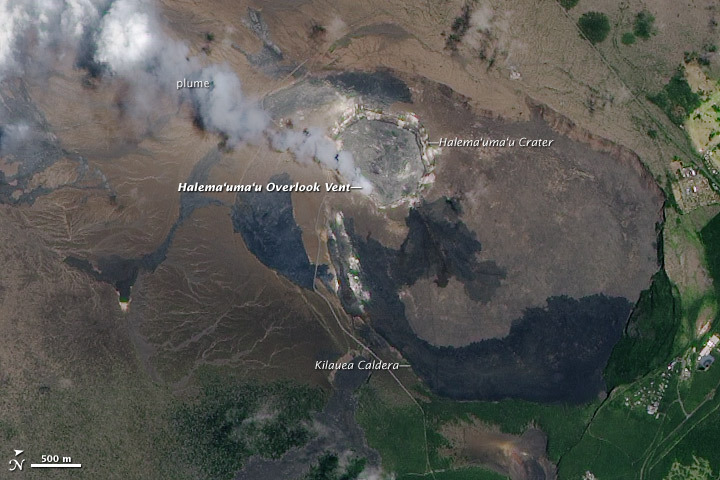 The crater itself sits within the kilometer-wide Kilauea Caldera, at the summit of Hawaii’s Kilauea Volcano. Old, weathered lava is colored brown, while relatively fresh black lava covers the eastern (lower) and southern (left) edges of the caldera. These lavas erupted in 1974 and 1982, respectively. 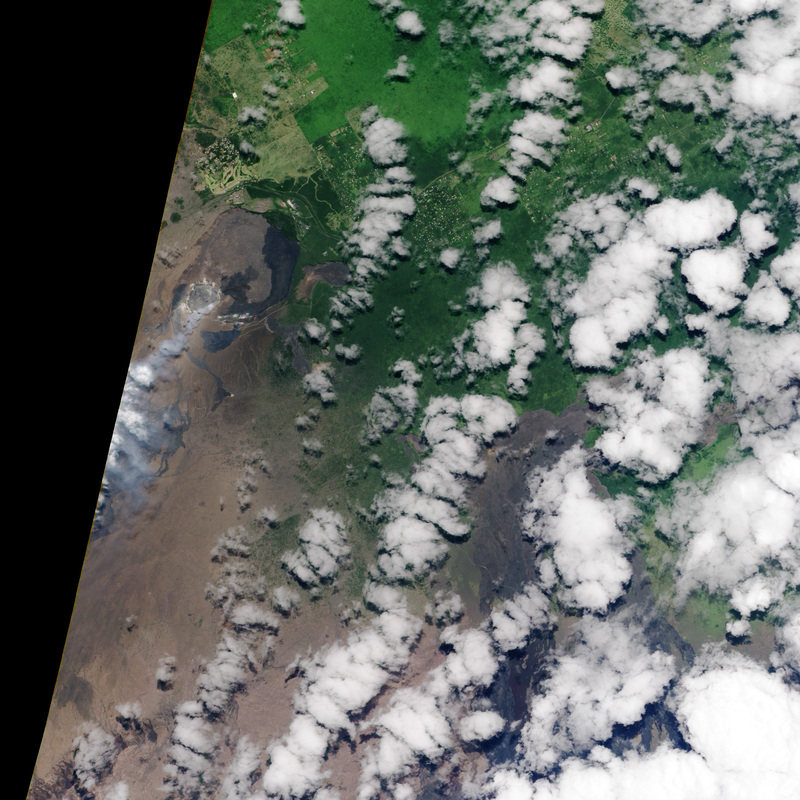 A dark green ohia forest covers the summit northeast (lower right) of the caldera. 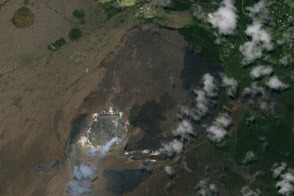 To the southwest (upper left), in Kilauea’s rain shadow, the semi-arid landscape is brown. A plume of water vapor, sulfur dioxide, and other volcanic gases continued to escape from Kilauea’s Halema‘uma‘u Crater on July 15, 2010. USGS. (2000, May 24). Age and Distribution of Lava Flows in Kilauea Caldera. Accessed July 22, 2010. USGS. (2010, July 22). Recent Kilauea Status Reports, Updates, and Information Releases. Accessed July 22, 2010.